« Boutique Port Coquitlam LA VIA Condos in Tri-Cities Real Estate Market Featuring 1 & 2 Bedroom PoCo Apartments Now Selling! Polygon’s newest community of exclusive low-rise North Vancouver apartment residences is coming this Summer to the North Shore Lynn Valley real estate market. Our return visitors will know that Polygon is our favourite master builder of multi-family homes. There are several reasons for this: great location, amazing offering including high-end features and floor plans that make sense. Couple this with true West Coast contemporary architecture that will never date and you have a boutique North Vancouver Canyon Springs Lynn Valley apartment community that will be highly sought after. The North Vancouver Lynn Valley real estate district has always been the most exclusive community in all of North Van and the new Canyon Springs condos will be centrally located within the heart of this idyllic yet central area at the corner of Mountain Highway and 27th Street North Vancouver. The presale North Shore Canyon Springs condos will feature a limited collection of 1, 2 as well as 3 bedroom homes. The three bedroom layout is a welcome addition to a neighbourhood where long-time residents want to downsize but require more than one or two bedrooms. The newest North Shore Polygon community at Canyon Springs North Vancouver condos will have urban contemporary West Coast architecture and the interior specifications (yet to be released in full) will include custom cabinets and sleek stainless steel appliances as standard finishes. In addition, as Polygon tradition is to finish apartment homes with the highest level of materials and features, Canyon Springs Lynn Valley condos for sale will also include smooth stone countertops, sophisticated detailed designs and laminate floors in the main living spaces. The open living floor plans will be ideal for modern urban lifestyles with outdoor balconies and terraces extending your living space outwards. As mentioned above, the new North Vancouver Canyon Springs Lynn Valley condos are centrally located close to everything. City amenities and recreational pursuits are equal distance from your front door. Just next door to your new Lynn Valley condo homes will be the heart of Lynn Valley Village, most noted for its boutique stores, casual and fine dining restaurants. The North Shore Canyon Springs Lynn Valley apartment residences will also be minutes away from the new and architecturally stunning Lynn Valley library and many local services. Major thoroughfares as well as transit routes are just seconds away. Other conveniences include grocers, banks, medical clinics and other professional services. The Lynn Valley Canyon Springs condos in North Vancouver are also ideally situated within minutes of all 3 local North Shore mountains: Cypress, Seymour and Grouse where you and your family can enjoy year end recreational and entertainment options. Downtown Vancouver is also just 15 minutes away via the Lions Gate Bridge. The Polygon Canyon Springs Lynn Valley apartments are also close to Kirkstone Park, Viewlynn Park, Hastings Creek Park and Kay Burrows Park. It’s just off Mountain Highway on 27th Street, just a couple of blocks east of Lynn Valley Road. Other highlights close to this new North Shore community includes the Capilano Suspension Bridge, Lower Seymour Conservation Reserve, Lynn Canyon and an abundance of nature trails, parks, and forests that you can enjoy year round. Whether you are into boating, skiing, biking and/or hiking, North Vancouver has it all. As well, the preconstruction North Vancouver Canyon Springs apartment residences will be close to a wide range of shops, services and restaurants in addition to Edgemont Village, Lynn Valley, Deep Cove and Central/Lower Lonsdale (to downtown Vancouver via Seabus at Lonsdale Quay). Park Royal in West Vancouver is also nearby as are numerous top rated secondary and elementary schools (both private and public). Capilano University is also close by. The actual Canyon Springs North Shore condo building address is 2519 Mountain Highway North Vancouver. The developer is Polygon Canyon Springs Homes Ltd. You can contact them directly at canyonsprings@polyhomes.com or by calling 604.871.4126 today. Presales are expected to start in early Summer 2013. More information is coming soon! Discover urban living at the mountain’s edge. 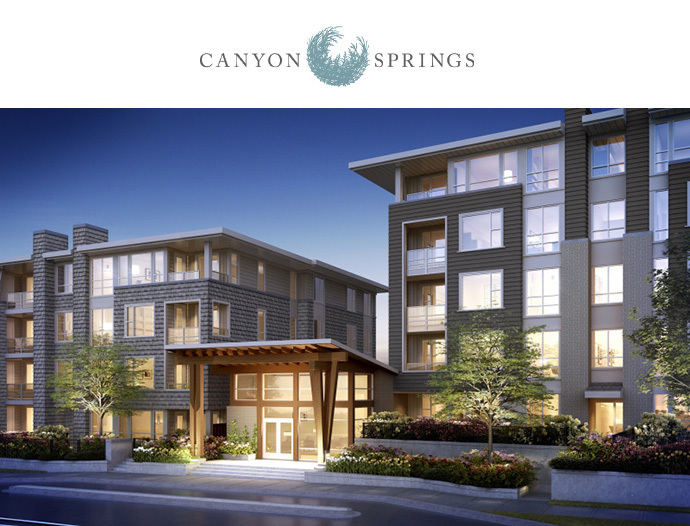 Inspired by the North Shore’s natural beauty, Canyon Springs North Vancouver condos by Polygon is a thoughtful collection of apartments in Lynn Valley. Imagine having restaurants and shops within walking distance, plus an abundance of trails so close to home. Canyon Springs North Vancouver brings you the full North Shore experience – and it’s easy to love! One, two and three bedroom Lynn Valley apartments are coming soon!